When it comes to research, federal funding encourages investments from nonfederal funders. 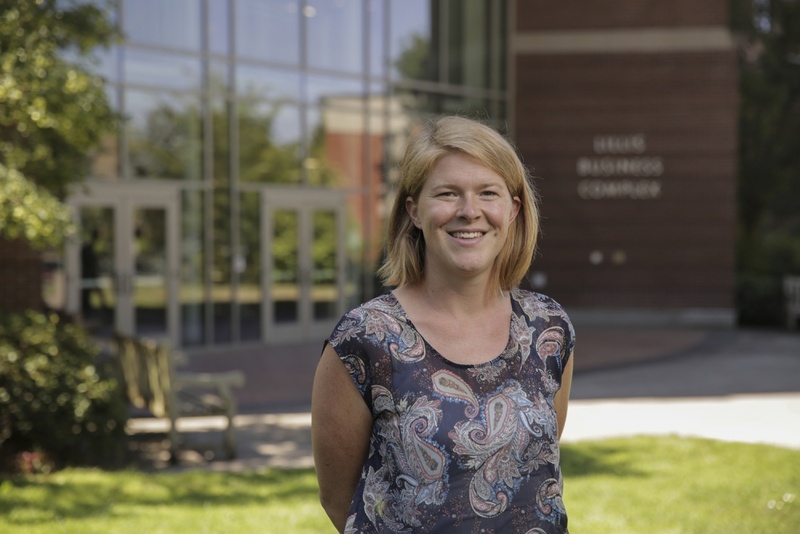 That’s the finding of a new analysis by Lauren Lanahan, a professor in the University of Oregon’s Lundquist College of Business. “This research shows that there is a positive relationship between federal funding and a series of nonfederal funding sources,” Lanahan said, referring to her paper, “The Domino Effects of Federal Research Funding,” in the June 21 edition of the online journal PLOS ONE. The paper examined funding trends for research-active academic science fields at U.S. doctoral-granting institutions. It found that federal funding of academic science projects encourages subsequent funding from other sources — including states, nonprofit organizations, industry and other entities. “We estimate that a 1 percent increase in federal research funding is associated with a .411 percent increase in nonprofit research funding, a .21 percent increase in state and local research funding and a .468 percent increase in industry research funding, respectively,” the researchers wrote in the study. Lanahan and her colleagues ran empirical analyses on funding data from the National Science Foundation. Controlling for prior funding trends, their analysis examined the relationship between federal and nonfederal funding sources. Lanahan pointed to the potential policy implications for her research. The question of whether federal funding discourages or encourages other types of funding has fueled debates on government investments in research and development. The issue, she said, is particularly salient for academic research institutions, given their heavy reliance on federal funding. A lack of consensus may be partly due to limitations of previous studies, she added. For example, some studies have examined federal funding for research and development and subsequent investment activity among industry supporters. Because private firms are less likely to share proprietary financial data, the research is subject to selection bias and arguably less reliable. In contrast, Lanahan said, seeing scientific research in the context of university research provides access to more complete, richer data. A change in the way information is collected from universities that receive funding for research and development allowed for a detailed examination of nonfederal funding. The NSF, in 2010, redesigned its survey of research and development expenditures. The new version — the NSF Higher Education Research and Development Survey — included data on field of research and funding sources. That provided Lanahan and her colleagues with an enriched longitudinal dataset that allowed a more detailed analysis of the issue. Lanahan and colleagues ran statistical analyses that control for prior trends of federal funding. They examined the relationship of federal funding with three sources of nonfederal funding: state and local, nonprofit and industry. Due to the open-source requirements of PLOS ONE, the research team made the data and code, including the code for building the dataset and running the empirical analysis, publicly available for replication and transparency. A hypothetical example to explain the results, Lanahan said, is that a $224,000 federally funded research project in the life sciences is associated with a 0.517 percent increase in industry funding and a 0.533 percent increase in nonprofit funding. Given the average industry funding levels, such a project could expect to see an additional $8,900 from industry and $12,800 from nonprofits. “The results suggest that organizations that fund science are all part of a system that is positively influenced by federal research investment activity,” the study concluded. The study was co-authored by Alexandra Graddy-Reed of the University of Southern California and Maryann P. Feldman of the NSF's program on Science of Science and Innovation Policy and a distinguished chair at the University of North Carolina at Chapel Hill. While the project was somewhat unconventional for a business school professor, Lanahan said, it fit well with her expertise. She focuses on public economics as it relates to innovation and entrepreneurship. She also investigates the role of public institutions in understanding the evolving enterprise of research and development. Prior to receiving her doctorate at the University of North Carolina at Chapel Hill, Lanahan worked at the NSF’s Directorate for Social, Behavioral and Economic Sciences. The experience, she said, gave her insight into the submission and reward process for grants and sparked an interest in understanding how institutions can effectively produce new scientific knowledge and bolster economic growth.